Bosch has announced that their new GTS1041A REAXX Portable Jobsite Table Saw will be their first saw to use their proprietary flesh-detecting Active Response Technology to help reduce table saw blade injury. The system on the Bosch REAXX Table Saw can detect when human flesh comes into contact with the saw blade, and in response will drop the blade under the tabletop to reduce injury. 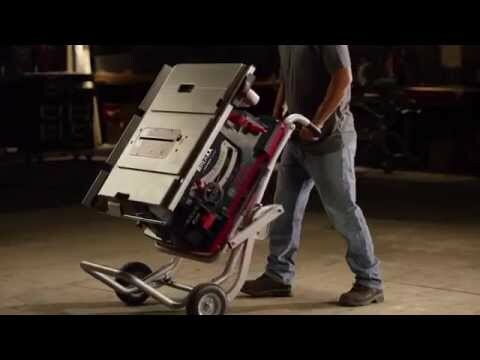 Bosch will obviously be competing with SawStop—the first to manufacture a table saw that uses flesh-detecting technology—but I think Bosch has one advantage that might win more people over. While the SawStop does a great job at stopping a moving saw blade, it also ruins the saw blade in the process. The Bosch REAXX Saw, on the other hand, does not. While this is probably not an issue when the saw just saved your hand from injury, it does become an issue if the saw is tripped because of a false positive. If a false positive does occur, Bosch says the system can be reset in less than 60 seconds using tools that are stored onboard. Furthermore, each cartridge is good for two activations. That, plus the fact that additional cartridges can be stored onboard, ensures that there is very little downtime. If the new saw wasn’t cool enough already, it also features a LED control panel system that indicates the status of the saw and manages the saws operation. It is here where an NFC enabled phone can communicate with the saw using an app to get information such as system activations, servicing needs, access to instructions, how-to videos and more. The app can also be used to manage who has the ability to access the bypass and main switches. 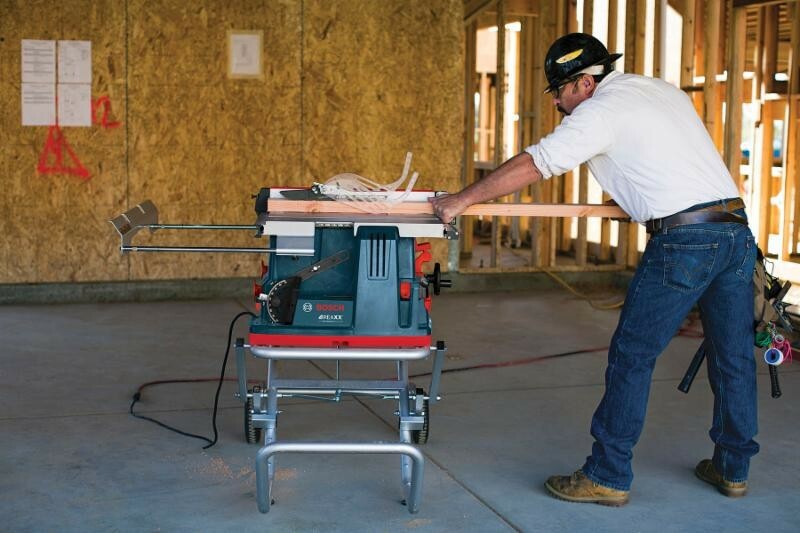 Building upon their 4100 series of table saws, the Bosch REAXX GTS1041Jobsite Table Saw adds that extra layer of protection on top of their already easy-to-use modular blade guard system. It uses the same SquareLock rip fence as the Bosch 4100 and shares many other features. The saw has a 15 Amp, 4.0 HP motor that spins up to 3650 RPM’s and provides an electronically controlled soft-start as well as constant response electronics. I think when you get down to it, the REAXX is an updated 4100 that also includes flesh-detection technology. One added feature is an onboard rear outfeed support that provides an extra 18” of material support. The Bosch GTS1041A-09 REAXX Portable Jobsite Table Saw will be available this Fall (2015) and will include a Gravity Rise Stand, for the price of $1,499. We all know that competition drives down prices and leads to more and/or better features. 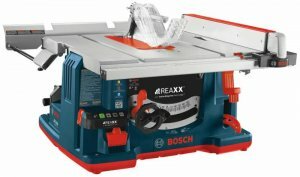 I hope that the Bosch REAXX Table Saw is just the first competition the SawStop will see. The Bosch GTS1041A Reaxx portable jobsite table saw offers flesh-detecting Active Response Technology, which prevents serious user injury while saving time and money by preserving the blade. The saw can be reset in seconds after activation to maintain productivity and continuously communicates status through an on-board control center. The existing Bosch Smart Guard System, the first line of protection against user/blade interaction and kickback, combines with Active Response Technology to deliver an industry-leading safety system. This video is property of Robert Bosch Tool Corporation, LLC.